If you are in Rio Linda, CA, never again will you have to wait hours in a dingy, stale waiting room with burnt coffee and old magazines to have your vehicle repaired. Rio Linda Mobile Auto Repair, in Rio Linda, CA will dispatch a fully equipped repair van right to your door—at NO EXTRA CHARGE—and have you safely back on the road in about an hour! Welcome to Rio Linda Mobile Auto Repair, in Rio Linda, CA, full-service preventive maintenance and automotive repair center servicing in Rio Linda, CA and its surrounding areas, including We perform high quality, guaranteed service you can trust at a fair price. No matter wherever you are, we will find you. We repair domestic and foreign vehicles and are your best choice for scheduled maintenance of your car, SUV, truck and fleet vehicles. We enhance overall performance and extend road-life. We go to your location for all your vehicle’s tune-ups, diagnostic services, maintenance inspections, lube services, filter replacements, and more. Enjoy your exceptional road travel for as long as you drive your vehicle. So, don't waste your time at a mechanic shop, just let us know where you are in Rio Linda, CA we will be right there. 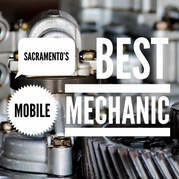 Rio Linda Mobile Mechanic : 916-306-5254. Things to do while I work on your Car! From Trip Advisor, Hey be a tourist in your own town once in A WHILE! Learn More to do while I work on your Car!